For the past few years I have gotten together with friends to work on our Vision Quest (Vision Boards) for the year. We always do this in early January as it is a great time to reset and to envision what we want for the year. It is also just fun to get together with friends, catch up and have some lovely snacks. We plan to get together again halfway through the year to see where everyone is at and to visit with each other. As most of you know, I retired from my full time job with CMHA at the end of December 2018. I was so surprised to see this on my Vision Board from 2018. I had no plan to retire and in fact was planning to work for two more years. 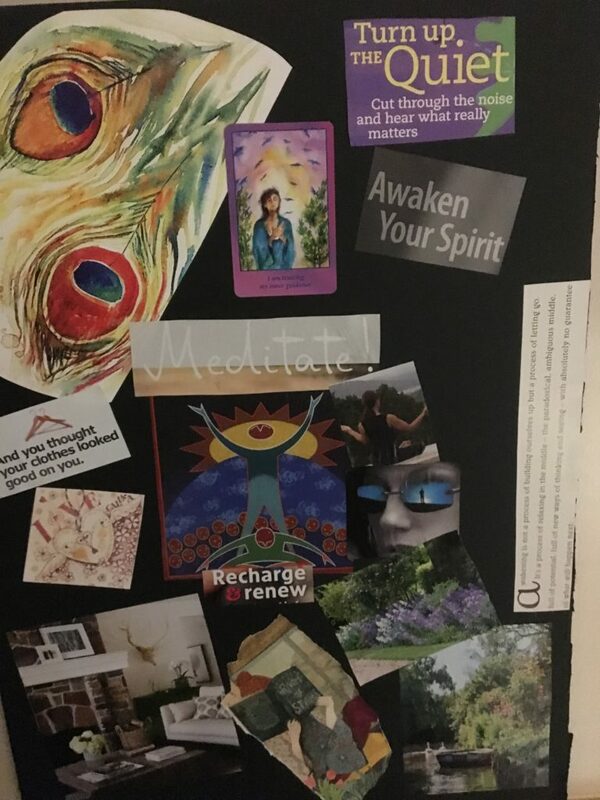 Vision Boards are So Powerful!! Vision Boards are not for everyone. It can be a bit overwhelming to think about what you want to have on your board and what you want for your life. Some big questions for sure. It can be helpful to do some work on this before getting together to start the work of putting your board together. It can be really important to be grounded before doing this work with a meditation or smudging with sage as it is good to be in the right mindset. It is good to have a focus and perhaps to narrow it down to a few areas in your life. It could be Work, Relationships, Family, Personal Growth for example. This year I worked on both sides of my Board. The first side is the personal aspect of myself and what I want to work on and the second is the work I want to do. As you can see it is a work in process. Our visions and intentions for what we want will change over time and we are always a work in process. I really love the flow of this and believe that where our attention goes is what will grow for us. Writing down your goals and looking at them everyday is something that will help you to be able to make the changes in your life that will help you to move forward. 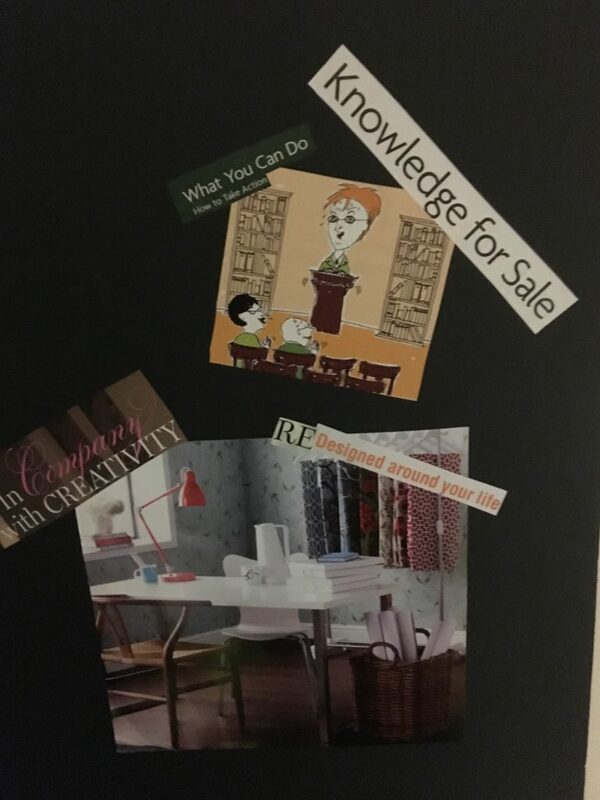 Have you had experiences or success with making your own Vision Board? Would love to hear from you? I’ve only made one vision board, and I don’t remember if it affected the outcomes. However, I once wrote a piece describing what I’d say if I ran into someone a year from now, everything that had taken place, and when I looked at it later, all but one of the things had happened. So I do believe this works! I think the reason I don’t do it all the time is that I’m afraid to find out it doesn’t ALWAYS work. 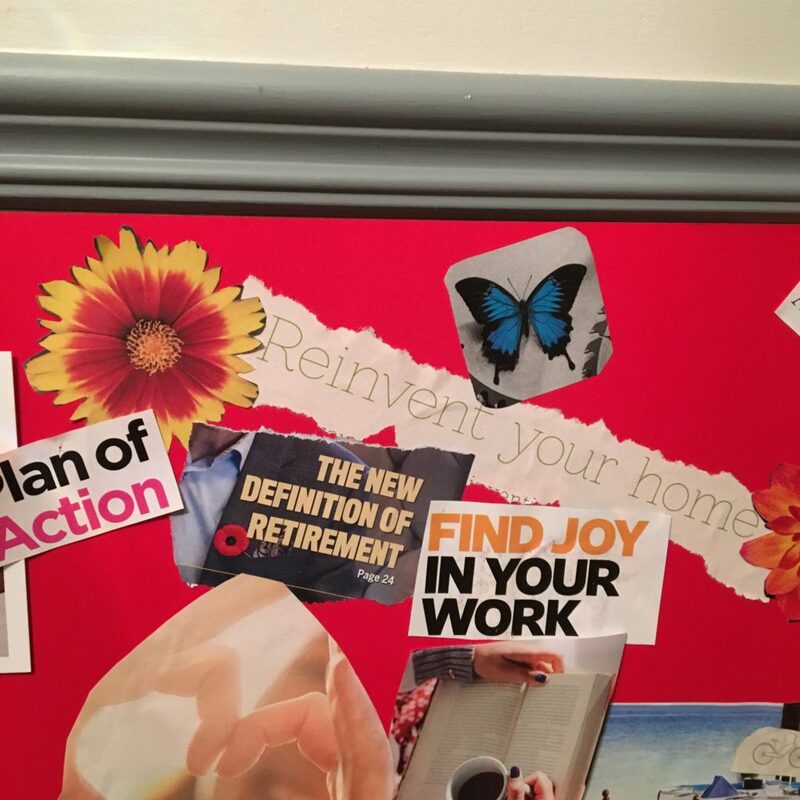 I love the concept of Vision Boards – I did my first one last year, and found it to be really powerful. I am still working my way through the one for 2019…it’s a little outside of my comfort zone, so I’m taking it a little at a time and not getting in a rush. I like to include a theme for the year, which helps me with choosing the other words and images. Love the idea of working with both sides of the board! I have offered a workshop “Organize Your Life with a Vision Board” to both adults and students. The participants enjoyed the freedom to express their goals in a creative way with paper and scissors and glue. It was a refreshing alternative to digital screens. Each one was proud of their work & wanted their picture taken with their vision board! I posted my vision board where I see it first thing every morning and it makes me start the day with a smile!! I love the idea of gathering with a supportive group to do vision boards. I agree with you, it is important to determine what your goal or vision is prior to this meeting. I haven’t ever made a board, but I see a lot of “buzz” about them, especially at this time of year. I think the process of making it is probably as valuable as the end result. Following your lead and intentionally setting aside time to prioritize and dream and plan is so valuable. If you can combine this exercise with a weekend away or a special meal, all the better! I do think that it would be fun to work on them in a group. I love that you have a tradition of getting together with your friends twice a year to make Vision Boards. I recall trying it many years ago but haven’t since. I can see how this is a powerful tool to help you focus on your intentions and wishes. I wish you all the best as you explore this next chapter of your life.